FLOW [For the Love Of Writing, For Lovers Of Words] started in 2015, to give a safe, open, and nonjudgmental space for people to explore what it means to find healing, creative inspiration and spiritual insight through the power of writing. 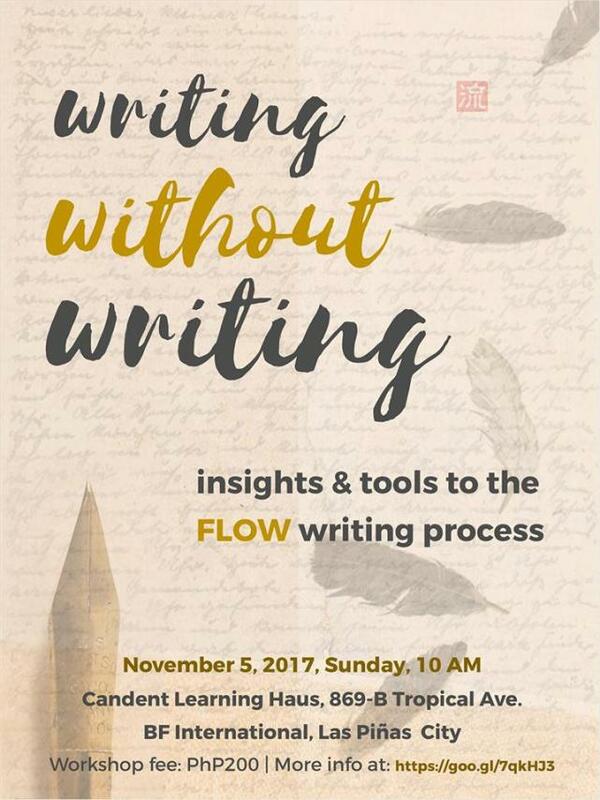 For FLOW's 25th session, we are launching a workshop entitled WRITING WITHOUT WRITING: Insights and Tools to the FLOW writing process. Candent Learning Haus in Las Pinas City will host us on November 5, 2017, Sunday, 10:00 a.m.
Workshop fee is Php 200. Slots are limited. To confirm your attendance, please register through the link below. When you confirm, we'll send you other details about the workshop.